I can say this the way it is. I am one lucky girl. I was raised on eating salade with every meal. A green salad very often, or une crudité (raw vegetables dressed into a salad) at other times. It was pretty much a family ritual, a habit so deeply anchored amongst us that should la salade be missing from the family lunch and dinner tables, we would systematically stare at my mum, feeling the urge to ask her: “eh ben alors, y’a pas de salade ?” (so what, there is no salad?) My mum being such an adorable sports, always there to try her best to please us with her home cooked food would nearly make it to the vegetable garden to get us some, to which we would put an end before it were too late “mais non, ce n’est pas la peine” (don’t bother), even if we felt the opposite. In fact, sometimes we simply did not as the cry for a green salad was stronger. But! Despite the fact that I have always eaten a salad with every meal going down my esophagus since a very young age, I am simply not one of the many who can make a meal only on a salad. A salad is simply not enough. It would leave me hungry an hour after I ate. Sometimes, however, I could almost only eat a salad. Enfin presque ! Well, almost! Earlier this month, I was reminded, once more too late, that on February 2nd, we celebrated la chandeleur. I wonder how comes that I simply can forget since it happens every year. In France, this originally Catholic festivity calls for cooks to prepare crêpes and beignets (doughnuts). Indeed, on the day of la chandeleur , the customs is to eat crêpes ! If asked to, I would not know where to start to explain my strong tie with this tradition. Often, I prepare sweet crêpes that we like to eat in a simple way, with squeezed lemon juice and sugar. 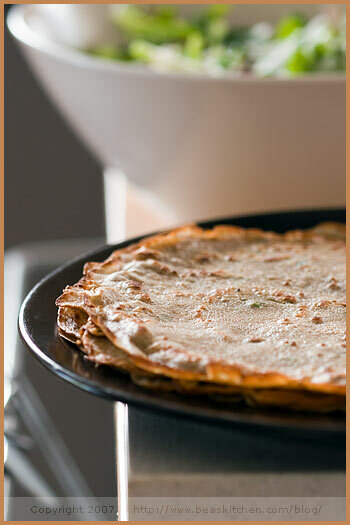 When not sweet but savory, instead of only using white flour, buckwheat is added to the crêpe batter. They become galettes. Before becoming a highly appreciated dish, present on the menu of every crêperie, galettes used to be the staple food for the poorest population. People used to eat galettes with soup instead of bread. Many debate the original galette recipe, each claiming they have the best. The truth is that recipes are endless. Should there be milk? Only water? 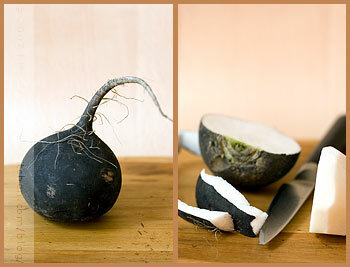 What proportions of buckwheat versus white flour? How many eggs? As far as I am concerned, after experimenting a little with different combinations, I ended up with one recipe that works well. I also wanted to make it a little more interesting when I decided to add fresh herbs and scallions. In the end, the key is to have a batter that is not too thick and that is left to rest for two hours. So yes, I had forgotten everything about la chandeleur and did not eat crêpes on that particular day. But I certainly made up for it with this dish. In fact, we liked it so much that I ended up making it a few times in a row. Because in the end, it is really the type of lunch I could have every day, making me forget that I am almost only eating a salad. Start with preparing the galette batter. Pour the two flours and salt in a large salad bowl. Make a hole in the middle and the eggs. Mix well before adding the water and milk. Mix until homogeneous. Add the olive oil and herbs with scallions. Mix well to make it light, and cover the batter. Let rest for 2 hours at room temperature. Melt some butter in a good frying pan and add enough batter to make a galette. Cook for a few mns on each side. Keep warm in the oven, covered. To prepare the filling, start with preparing the vinaigrette. Mix the sherry vinegar with the oil, salt and pepper. Add the chopped shallot and chives. Cut the apple in sticks and squeeze some lemon juice to prevent oxidation. In a large bowl, mix together the black radish, the two salads, feta, apple sticks, grapes cut in halves and caramelized pecans. Season with the vinaigrette. Take plates and place a galette on each. Put the salad in the middle and form a nest by folding the edges towards the middle. Serve immediately. Commencez par préparer la pâte à galette. Mettez les farines dans une jatte avec le sel. Ajoutez les oeufs battus. Mélangez bien, puis ajoutez l’eau et le lait en filet. Ajoutez les herbes, les oignons tiges et l’huile d’olive et travaillez bien la pâte au fouet pour l’aérer. Couvrez-la et laissez reposer pendant 2 heures, à température ambiante. Faites fondre un peu de beurre dans une poêle et versez une louche pour réaliser une galette. Faites quelques minutes des deux côtés. Couvrez et gardez au chaud, au four. Pour préparer la salade, commencez par préparer la vinaigrette. Émulsionnez le vinaigre avec l’huile, du sel et du poivre. Ajoutez l’échalote hachée et les herbes. Coupez la pomme en bâtonnets et citronnez-les pour empêcher qu’ils oxydent. Dans une jatte, mélangez le radis noir, les salades, la feta, les bâtonnets de pomme, les raisins coupés en deux et les noix de pécan caramélisées concassées. Prenez des assiettes et placez une galette au centre de chacune d’entre-elles. Mettez de la salade au milieu et repliez les bords pour former une sorte de niz. Servez sans attendre. *Remarque : vous pouvez remplacer le radis noir par du fenouil coupé très finement, que vous faites mariner avec 2 càs d’huile d’olive et le jus d’1/2 citron, du sel et du poivre, pendant 1 heure au frigo. Un déjeuner sain, coloré et équilibré, je prends ! YUMMY�?realy like the chinese SPRING CAKE! I claim to be able to lunch on salads, but I’d probably not be quite so honest as you and call this a salad 😉 By the time I’ve thrown on walnuts, cheese, and maybe some little filo pastry parcels, it really gets quite filling. And hey, the pastries perch on top, so that counts! Je vais me mettre cette recette au chaud pour un dîner léger ! Well, yes, what a salad! 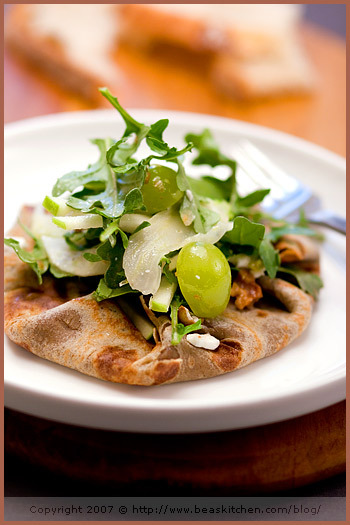 So the buckwheat changes it from a crêpe to galettes. sain, simple, délicieux! What a gorgeous lunch! I’m definitely trying this one out! I’ve always preferred galettes to regular crepes. Gorgeous! C’est depuis mon voyage en Bretagne cet été que j’essaye de trouver l’equivalent du ‘blé noir’ au Etats-Unis, and I had long lost hope to ever find it! Merci pour la recette, je sort à l’instant trouver du ‘buckwheat’ (le sarrasin c’est bien la même chose que le blé noir n’est-ce pas?). sounds good for some healthy eats bea! Hmmm, you got salad growing up…I got frozen fish sticks and Kraft dinner….you win. I was raised just like you described, there was always salad on the table to be eaten with our rice and beans + some sort of meat. I’ve always loved salads but were never able to eat only salad. These gallets sound wonderful and I’d love to try some! tu penses si ça me parle! moi je suis comme toi, toujours une petite salade en entrée, mais j’avoue n’avoir jamais pensé à y associer de belles galettes! Bea, I posted a pre-pancake day (UK) text and a colleague who lives in France mentioned the 2nd February. I replied asking her what the origin is.So you can imagine how great it was to read about it here.Plus I adore your twist on the filling. As usual, your posts are so great and refreshing. i have loved salads at every meal since i was little!!! 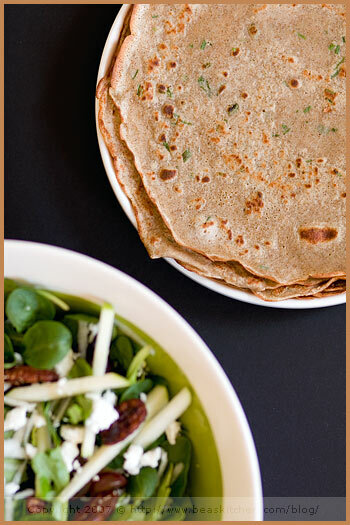 i love the idea of a “savory crepe” – i would never have thought of doing that. this seems very lovely! Yep! Salade ou soupe faisaient toujours partie du diner, et c’est une tradition que j’ai garde en immigrant. Moi aussi, j’ai fait mes crepes apres la “bonne” date, mais les galettes et les crepes c’est bon tout le temps! we have salad with every meal, too, and usually eat it in the same plate as beans or lentils. Grosses everybody out, but it´s brilliant. I´m still mulling over my FIVE, by the way. J’adore les salades composées mêlant herbes, fruits, fromages ! Avec tes galettes de sarrasin, cela suffira à convaincre mon gourmand de mari toujours un peu réfractaire au déjeuner “Salade” ! C’est une excellente idée, merci pour l’inspiration Béa ! I was raised to have salad with every dinner, but not salad alone for dinner. 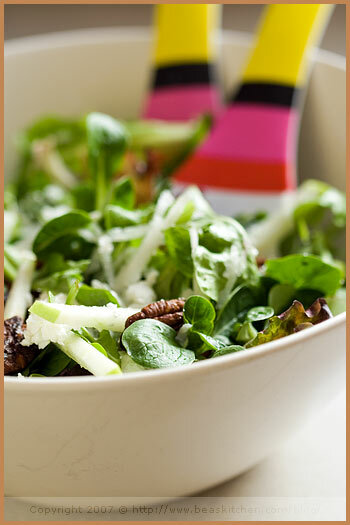 Now I love to eat salad for lunch or dinner, often as the main attraction. I’ve not tried it with galettes, but yours look so lovely, I think I will have to try this. I was looking forward to pancakes for supper tonight but I might try the galettes out instead! Mmmmm…the salad looks so delicious! And what a great idea, I have never thought of serving a salad on crepes. I love it and can’t wait to give it a shot. En tant que bretonne de coeur et membre du club des mangeurs de salade à tous les repas, j’adopte tout de suite ce plat ! This was again very delicious! It was as being little bit at your home!